As promised, this post is a follow-up on last night’s article where I briefly shared some thoughts on the 2014 Tour de France, Nibali’s performance. The mountains are now done, and thanks once again to the work of Ammattipyoraily, Antoine Vayer and Dr Mike Puchowicz, we have a set of data that stimulates interesting discussion, sometimes skepticism. This post is my attempt to explain this year’s Tour by the numbers, to return to the physiological implications that, in my case anyway, conceived the method back in 2009 when Contador won on the Verbier. If you’re looking for definitive answers, I can save you the trouble and say there are none, so you needn’t continue reading. It’s also quite technical, because I want to paint some scenarios. But if you’re looking to understand the range of possibilities and generate a few hypotheses for the future, then let’s see where it takes us. Let’s start yesterday. Vincenzo Nibali confirmed his dominance of the Tour de France with a comprehensive victory on its final climb. Responding to a move by Chris Horner (something he didn’t need to do, so it showed his intent), Nibali left the the battle for second, the white jersey and the KOM jersey behind, on route to producing the 27th fastest time in Hautacam’s relatively short, but very tainted history. This brings us to the first fork in the road. You can look at this as a signal of positive change in cycling. If the dominant rider in the race, doing what I really do believe was close to maximal effort for most of the climb, is over two minutes behind a group of known dopers of the 1990s, then we are clearly in a better situation than we were then. To put it into context, Nibali’s margin of victory yesterday (500m) was just over half of what he’d have conceded to the fastest ever ascents, and that could well prompt people to suggest that we’re seeing a different sport now. On the other hand, when you see the names closest to Nibali – Zulle, Piepoli, Berzin, Rominger – you could just as easily adopt a skeptical position, based on exactly the same performance. You might also point out that in 1996 when Riis produced the fastest ever time, there was no ascent of the Col du Tormalet prior to Hautacam, and it was supposedly an easier stage that happened a few days earlier in the race, and certainly not at the end of three difficult days in the Pyrenees which itself came at the end of a race with more mountain finishes than those before it. Rumors of a headwind make the performance seem even more ‘super-human’. But, the optimist will say, the stage yesterday was much shorter – only 145km compared to around 200km for both 1996 and 2000. Point is, this is where you end up if you try to over-interpret a single performance. Last year, I called it performance pixelation, because it’s the equivalent of looking so closely at the picture that you see nothing of the picture. All this achieves is to create a tennis match, where each side gets a shot, and the end result is that those who want to believe will, and those who don’t will find a way to discredit the performance. This is why it’s important to look collectively at all the performances, and we haven’t even begun to dig down the race where more insight might be found. However, we have a good start now, and so let’s look at 2014 compared to 2013, big picture. It expresses those power outputs as a function of climb time (because longer climbs are ridden at lower power outputs, of course), and he has also normalized the W/kg for altitude, drag and body mass, to make comparisons across different riders and climbs possible. In the background, the grey dots are the podium rider performances from 2008 to 2012. First, if a climb is less than 40 minutes long, 6W/kg is necessary to win. Beyond this, 5.8 to 6.0W/kg wins the Tour. But we all knew this already – it’s been the case for five years. Second, Nibali 2014 and Froome 2013 are very, very evenly matched. Nibali’s best performances were a 6.3 W/kg effort for 17 min and 6.2 W/kg for 32 min (his best, Risoul). On Hautacam, estimates range between 6.0 and 6.2 W/kg depending on wind assumptions. Last year, Froome produced a 23 min effort approaching 6.4 W/kg, was better than Nibali on the longest climb (the 50min effort), and comparable on the others. 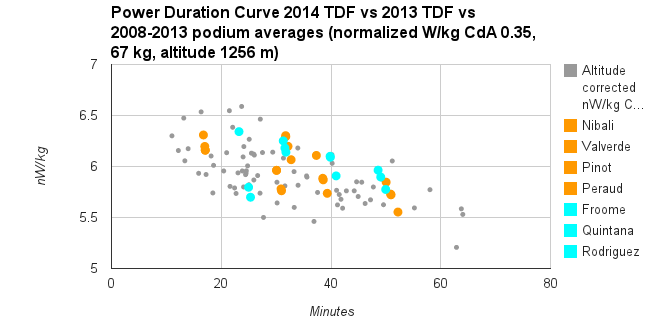 The rest of the podium/top contenders are, with one exception, slower in 2014 than 2013. Quintana last year was climbing at the level of Nibali this year, apart from that short climb where Froome was so dominant on Ax-3-Domaines. Obviously, we must avoid direct comparisons – they’re on different days, different situations – but I think it’s safe to say that the 2013 and 2014 Tours are comparable, performance wise. What a shame that we were denied the opportunity to see Nibali challenged by Froome and also Contador, who did more than enough in the lead up to the race, and its first small climb, to suggest he was at the same level. Overall, the graph above, much like the Hautacam performance, gives you two possible interpretations, one optimistic and the other cynical. You can say that the performances are historically comparable to those from the period 2008 to 2012 (the grey dots), and thus be optimistic that this ‘new era’ in cycling (which supposedly started post biological-passport) persists today. Of course, this relies on the somewhat circular argument that those grey dots represent clean performances, and given that a few names have fallen foul of doping controls in this period, that seems highly unlikely. Rather, what you probably want to be able to conclude is that the Tour today is not worse than it was in the pre-biological passport days, when the 50% HCT rule was used, and pre-EPO testing, but it’s also not obviously better. The cynical perspective says that Nibali and Froome are producing performances comparable to doped ones from those eras. Your ammunition is this graph, also by Dr Mike Puchowicz, which compares the performances of the top riders to historical benchmarks from two eras. First is the pVAM, a predicted climb performance based on gradient, altitude and duration of the climb from 2008 to 2013 (in theory, “clean”. Yes, I know…). Second is the dpVAM, which is a predicted climb performance from the period 2002 to 2007 (in theory, “doped”). 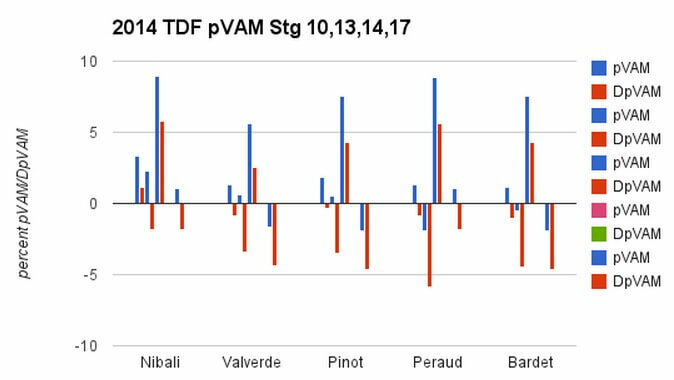 So this shows that Nibali was always faster than the pVAM (all blue bars above the x-axis), and on two occasions was faster than the dpVAM (Stage 10 to Belles Filles and Stage 14 to Risoul). Then again, everyone was faster than the dpVAM to Risoul, and a lot faster than the pVAM (another reason why taking an isolated performance is a shortcut to disaster, and a reason to look at that climb to understand why this may be). Note that the graph doesn’t include the Hautacam climb, but I’ll get that up as soon as it has been added. The rest of the race were, much like last year, hovering at or around the pVAM, but below the dpVAM. If we now work with the collection of data that says that Nibali is able to produce around 6W/kg for 35 minutes, at the end of a Tour stage, we can begin to deconstruct the physiology at the front of the race. To do this, we use Jean-Christophe Peraud, currently lying in third, and who managed to climb with Nibali on two occasions in the mountains. He provides a useful barometer because his VO2max is ‘known’ to be 85 ml/kg/min. This according to Antoine Vayer and also Frederic Portoleau, who’ve tested him a few times. Because we know the VO2max, we can reduce the number of assumptions required to investigate the physiological plausibility of riding at 6 W/kg. We still have to make some assumptions, around the efficiency of the rider and his ability to sustain a given percentage of maximal for the climb. Cycling efficiency tends to be between 23% and 24%, though there are some contentious publications where it has been measured as high as 26%. The thing about efficiency is that logically, if you are highly efficient, you tend to also have a lower VO2max. The two are inversely related, as this paper by Lucia et al showed. So take Peraud: The VO2max of 85 ml/kg/min is very high (the Lucia paper tested professional cyclists and the highest VO2max was 82.5 ml/kg/min (average was 72). Lance Armstrong, in the infamous Coyle paper, was measured at 81 ml/kg/min). Therefore, in order to produce this performance, Peraud would be riding for 35 minutes at 85% of his maximal capacity. Is that plausible? Yes, I think so, at least on paper. It’s exceptional, because to sustain that level at the end of say 4 or 5 hours, in a three-week stage race is right on the upper limits of performance capability. But then, if you’re finishing on the podium of the Tour de France, you should be there. Peraud gives us some insight to Nibali, by virtue of the fact that he rode with him on two occasions when the Italian was attacking the race. You can make the same assumptions for Nibali (all reasonable) and you arrive, obviously, at the same conclusion – plausible but at the very limit. He rides at 91% of maximal for that climb duration, which starts to become a little bit less believable. Alternatively, he could ride at 85% of max, like Peraud, if his efficiency is 25%, rather than 23.5%. Once again, all are plausible scenarios, and any combination of them doesn’t change that fact. It’s only when you start to get to the 6.2 – 6.4W/kg level that you start to stretch the assumptions. He would need to ride at 91% to produce that performance. Plausible? I’d argue not, at the end of a long stage. Even 85% is pushing it, but this is the big question. Certainly, once-off efforts at this intensity are possible, and when rested, expected. But the repeat demand over many days is the challenge, and that’s why the presence of bad days are always used as a sign of a clean rider. It’s unlikely that simple, but you can see the logic, when athletes are on the very limit of physiology, we expect to see a show of weakness, at least sometimes. The model also allows us to predict what kind of physiological difference must exist between riders to create the gap between Nibali and the rest. As you may by now expect, it’s very small. For instance, if we ‘anchor’ the sustainable intensity at 85% of max, and the VO2max at 85 ml/kg/min, then a 5% difference in performance (6 W/kg vs 6.3 W/kg) could be created if one rider had an efficiency approximately 1% better than another. For example, if Nibali was at 24.5% and Peraud at 23.5% efficiency, all other assumptions held constant, Nibali’s performance could be 6.3W/kg and Peraud’s 6.0W/kg. That illustrates that what we see as huge dominance is potentially the result of very small differences. If you now assume that the difference between the two riders exists for all three “input variables”, then you can create a scenario where having a VO2max of 86 ml/kg/min compared to 85 ml/kg/min, and an efficiency of 24% compared to 23.5% and a sustainable performance of 87% compared to 85%, then you’ll also be that much better than the competitor. If your head is spinning, I apologize. I explain this to illustrate that performance, the estimate we obtain, is the result of a few different ‘strings’, all of which can be pulled in numerous directions, and which have implications for whether a performance is plausible. Making some conservative assumptions (that benefit the rider), you can arrive a point where you say “these are plausible”. That is was Fred Grappe did last year when he got access to Sky’s power output files, and it’s the same now. So, this is why it’s not right to say that the Nibali performances are suspect purely by their physiological implications. They are plausible. However, what is missing is historical context, in the sense that history showed us that cyclists who produced 6 W/kg in the Tour de France (and sometimes 6.5 W/kg) were almost always doping. Between the mid-1990s and the mid-2000s, the kinds of performances we see today (and in 2013) were achieved only with doping, and so to join that company invites the possibility that the modern rider is also doping. The fact that basically every cyclist who has achieved power outputs beyond 6 W/kg has done so with doping also tells me that the physiological model I used above is probably a little conservative, too beneficial to the cyclist. History suggests that the 85% outcome you come up with, while theoretically plausible, was possible only when doping, and that the true limit, “undoped”, is probably 80%. If that is the case (this is a hypothesis), then those performances above, while plausible on paper, become impossible. History, plus physiology, thus provided the basis for skepticism. Neither is proof of doping, or being clean, but it helps to explain why the question exists. So this is the dilemma: The performance neither proves nor disproves doping. The history neither proves nor disproves doping. But the combination of the two allows a cynical evaluation. Exactly the same numbers – 6 W/kg, VO2max 85 ml/kg/min, efficiency 23.5% and 85% of maximal capacity – can either be used to prove a clean sport, or a dirty one, because they lie on that narrow ledge between the two. You see how that’s exactly the same as the Hautacam scenario? The same as all the 2014 performances? Cycling’s problem is that it hasn’t really convinced the skeptics (most of whom started as believers) that we should accept those numbers as plausible, mostly because of how the sport and doping seems to be managed. We look at the doping period of the sport, and we look at the current period, and see the same people, albeit in different roles, pulling strings. We see former riders who doped now managing riders who want us to believe they won’t. And maybe they’re right, but cycling played its blind faith “just believe in us” card a long time ago, with the “Tour of Renewal” and constant deception the outcome. What this scientific aspect to the sport requires is consistency – you can’t, as some have, call Nibali a doper based on his performances but not recognize that last year’s Tour was slightly faster, and more men were in the same ‘doping’ area as him. It also requires more depth to the data. So far, we have analyzed only the GC contenders. There’s a picture waiting to be discovered from the entire race. For instance, what percentage of the field is able to climb at more than 6 W/kg, 5.8 W/kg, 5.5 W/kg on the finishing climbs, and so on? Does a power output above 5.8 W/kg on one day or climb change the likelihood of it happening on the next climb? Another question – is the power output on climbs midway through the stage lower than it used to be? For instance, yesterday the peloton climbed the Tormalet over five minutes slower than they did in 1996, when Riis went on to win at Hautacam. That’s significant, and it would be interesting to analyse whether the performance on those climbs has changed, as one would hypothesize it has. It’s the athletics equivalent of the marathon world champion running the final 10km in 28 minutes (way faster than world record pace), but only because the first 32km were done much much slower. Of course, added to these questions is the need (and our desire) to actually see the real data, rather than work of estimates. We have only scratched the surface, but I am convinced that the method has merit. Overall, my conclusion is this: Cycling IS in a better place than it was – Nibali’s 2 min deficit to the riders of the 1990s indicates this, as does the general trend that GC contenders are considerably below the dpVAM and the historically doped performances. Current performances are comparable to historical contexts, and also fall within the range of physiological plausibility (given some conservative assumptions). There’s reason to have some hope. I believe that the biological passport (clumsy as it sometimes seems, under the control of the authorities) has made doping more expensive and more difficult, and while it has not eliminated doping, it has likely reduced the extent of it and thus the benefit compared to the days when EPO could be used without risk of detection, and then when blood doping was undetectable. Now, we watch a world of micro-dosing, and understandably, the performance benefit will be smaller. That’s why the times of today are slower than those of the mid-1990s and early 2000s on big climbs like Hautacam and Alp d’Huez. This is not the same thing as saying it eliminated doping, and cheating is cheating, however small the benefit may be (in some respects, the more sophisticated it becomes, the worse it is, actually). But there’s hope yet. But blind hope is what got us here in the first place. The failure to question performance observations after the Festina scandal ushered in a new era of deception, rather than the ‘renewal’ we were promised. When Lance Armstrong climbed at the same speed as the dopers, and got his name on the lists of all-time fastest performances, more people should have sat up and taken notice. David Walsh did – he pointed to Armstrong’s speed and sudden improvement as two crucial pillars of his pursuit of the Texan. He ‘got’ Rasmussen the same way. Yet he we are, fifteen years later, and the same performances relative to the dopers and the same improvements are happening in front of our eyes, but this time, it’s different? Why? The exercise we’ve done this year, and last year, and the year before that, would have strongly pointed the spotlight of suspicion on Armstrong and his GC rivals, and it would have been correct. It would have pointed that same finger at Pantani, and been correct. It would have pointed that finger at Hamilton, Ullrich, Basso and many others, and each time, been correct. The question then is why not also for Nibali, Froome and Quintana in 2013 and 2014? The comparisons are the same, the data says a similar thing – plausible, but at the limit, and comparable to doped riders. Further, the people in the sport are the same, now doing other jobs. Perhaps they are clean, and perhaps the sport has edged into a new era where 6 W/kg can be achieved sans doping. It couldn’t before, or rather, it wasn’t before. Maybe it is now. But blind faith is not going to help anyone. So keep asking the question, but without judgment. That’s what the sport needs.